Help Ummah Relief with Sadaqa/Sadaqa Jariah distribution programs. Oh mother, I can’t sleep. Give me the warmth of your lap. Put your love on my forehead. Sing a sweet lullaby to me. Put away all my grief. Give me peace in my heart. I haven’t slept for many nights. To prepare and distribute for the daily meals program for orphanages, hospitals, homeless people, widows and needy people, we need your financial support. Please help us to make things better. Besides the Udhiya/Qurbani, Zabeeha, Aqeeqa/Sadaqa programs, please contribute year round.Donate and get involved with our Qurbani Online Programme this year. 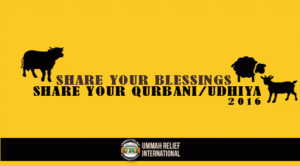 Make your Qurbani donation online this Eid ul Adha. Please share happiness with them. Donate your zakah and sadaqah May Allah reward you for your help.